$60 Inc. HST (2 Tickets For $100). Click Buy Tickets Below! The Red Dress is the official symbol of The Heart Truth campaign. It’s feminine, strong and confident, capturing the spirit of the cause in a symbol that women across Canada can identify with and feel proud of. 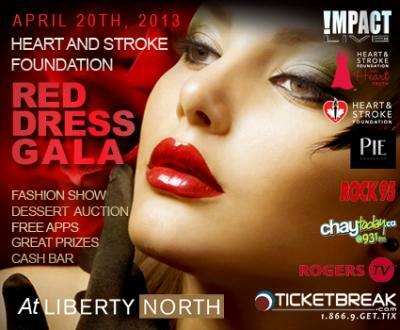 The Red Dress represents women’s courage and passion and their power for change as they share the truth with others and raise awareness about the importance of heart health.The Red Dress Gala is April 20th at Liberty North in Barrie. Click The Above Banner To Visit The Official Facebook Page & More Information!